We did it nearly 100 years ago and now "In the future, we might be heating our houses with dog poop." Several countries do this and some even survive by it. San Francisco Animal feces make up nearly 4 percent of San Francisco's residential waste -- nearly as much as disposable diapers -- so it is a significant stumbling block to cities reaching their landfill goal. "American dogs and cats produce 10 million tons of waste a year, and no one knows where it's going," said Will Brinton, a scientist in Mount Vernon, Maine, and one of the world's leading authorities on waste reduction and composting. "That's really beginning to be looked at as a nightmare." Dog and cat waste usually ends up in a landfill, where it's mummified for generations in plastic bags. If it's not tossed out, it's left where it falls and dissolves into the ground, where it flows untreated into the water table or the bay. Or it's scooped up with yard waste and tossed into the compost bin -- which is a no-no, because animal waste is full of pathogens. The waste will be collected and tossed into a contraption called a methane digester, which is little more than a tank in which bacteria chew on poo for about two weeks to create methane. 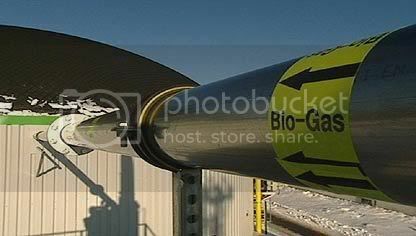 The methane can be piped directly to a gas stove, heater, turbine or anything else powered by natural gas. The idea isn't so far-fetched. Several European countries, developing nations elsewhere in the world and a smattering of American dairy farms already convert animal waste into energy. See San Francisco Chronicle for full - this article is old (2006) but the idea is over 100 years old. While the article sounds like a eighth grader wrote it... it makes a good point. California has 242 sewage wastewater treatment plants, 74 of which have installed anaerobic digesters. In the 17th century Robert Boyle, discovered that decaying organic matter produced flammable gases. And by 1859 in India was using it to power a leper colony. In 1895 a group of English scientists further developed the technology and used anaerobic digestion to generate gas for street lighting.